16 Apr Collect a 4⭐ Assassin Angel of Death GUARANTEED in the Lord of Light! Conquer the Lord of Light to earn Angel of Death AND Lilith Soul Fragments! Earn an Assassin Angel of Death in the Lord of Light Dungeons from April 16th to April 20th at 5pm PT! Each Lord of Light battle has a chance of dropping 5, 10 or if you’re lucky, 50 fragments! Collect 200 Fragments and you can redeem them in the Book of Souls’ Fragments screen for your very own 4⭐Assassin Angel of Death. The Angel of Death is a single target true damage dealer who inflicts Perfect Bleed on the enemy, and can grant team wide Invincibility, Increased Attack, and Increased Magic for 2 turns. His passive ability, Unto Death, grants Endure and Counterstrike to allies, and will fully heal them should any ally’s HP fall to zero! We’ll be running an all-dungeon weekend so you’ll be able to collect Fragments up until this event ends on Saturday April 20th! 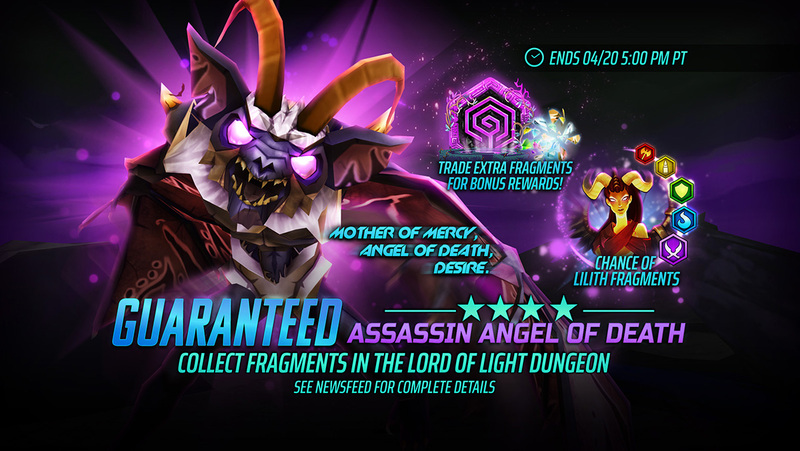 We’ve placed a free pack of 10 Assassin Angel of Death Fragments in the Store to get you started! Trade extra Assassin Angel of Death Fragments for additional rewards in the Event Store! 250 Assassin Angel of Death Soul Fragments will get you 50 Talisman Soul Fragments, whereas 300 Assassin Angel of Death Soul Fragments will get you a Labyrinth (Shield) OR Labyrinth (Barrier) Talisman! Labyrinth Talismans are purple talismans with a 5 set effect! Equip them for a 60% Chance to take no damage when attacked. You will take random damage based on 10% of your Max HP and inflict ATK Down, MAGIC Down, and Stop on each enemy for 1 turn when successfully hit. 🎉Collect Lilith Soul Fragments! These special Fragments have a chance of dropping from all floors of the Lord of Light dungeons during this week’s Assassin Angel of Death event!